This controller is ROVsim compatible, designed to withstand constant use and built to last ! The joysticks are positioned literally in the palms of your hands. The right main hand joystick controls the horizontal thrusters (left, right, sideways, forward, reverse) and the left dial controls the vertical thrusters ( up and down). While maneuvering the thrusters, you are also within fingertips reach of the toggle and button switch controls, never having to be distracted. 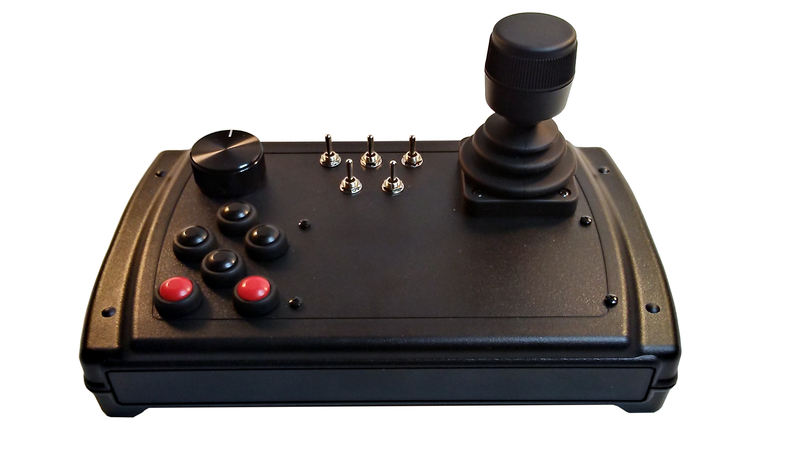 The controller includes a total of 16 switch controls, one three-axis Hall Effect joystick and a single industrial potentiometer that can all be reconfigured to suit your needs. The construction of these control boxes are made with durable strength plastic and industrial strength joysticks, buttons and switches.